Samsung takes on Sonos with wireless, multiroom speakers | What Hi-Fi? 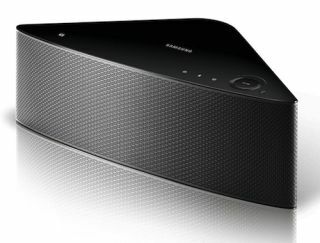 Samsung has released more details on a new range of wireless speakers for 2014, and its sights seem firmly set on Sonos. You'll be able to buy M5 (£230) or M7s (pictured £330) as individual speakers, much like the Sonos Play:3 and Play:5, but at a recent launch event, Samsung was quick to sell the merits of using them in a multiroom set-up. The speakers can be used as stereo pairs, and can also connect to the company's HW-H750 (pictured) and 'H751 soundbars, to play the part of wireless rear speakers. Again, in a similar way to the way you can link the Playbar and two Play:3 or Play:5 speakers. You can even turn them into a complete, wireless surround sound package. Your Samsung TV decodes any audio, before splitting and sending the signal off to the wireless speakers. To get the M5s and M7s working on the same wavelength you will need Samsung's WAM250 multiroom hub (pictured, price tbc). It hooks up to your router and allows you to beam content to different speakers. Add the Link Mate WAM270 (price tbc) and you can plug in your hi-fi separates and stream music to any M5s or M7s on your network. The Link Mate can handle high-res audio up to 24bit/192kHz and features optical/coaxial digital inputs and a set of analogue inputs too. All the speakers are controlled using Samsung's Mutiroom app for iOS and Android devices. They'll also come with access to music streaming services built-in, including Spotify, Deezer and Napster. This means you won't have to push music from mobile devices – the speakers will be able to acccess your account directly and play different songs through different speakers. The Samsung WAM250, WAM270, M5 and M7 should all be available by the end of April.